Public speaking is an uncomfortable activity for adults and students alike. Preparation and practice will help. In my classroom, I want my students to have several opportunities to practice speaking to their classmates. 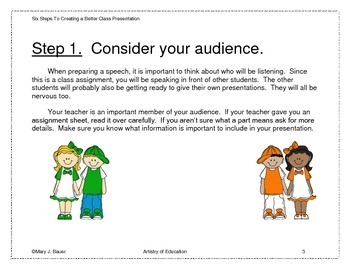 The following assignment gives students a procedure to prepare their oral presentations. 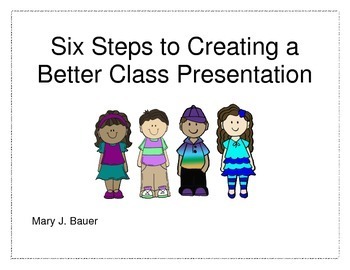 I often attach an oral presentation to a science, health or social studies project. 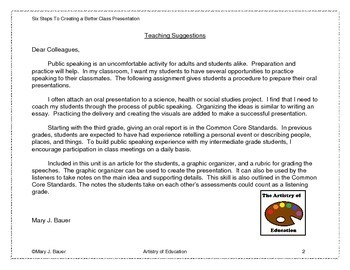 I find that I need to coach my students through the process of public speaking. Organizing the ideas is similar to writing an essay. Practicing the delivery and creating the visuals are added to make a successful presentation. I let students use the buddy system when delivering their presentations. The speaker may choose another student to stand with him/her and hold any visuals. This makes everyone more comfortable standing in front of an audience. Even reluctant public speakers are happy to help someone else with their speech. We talk about how most people get nervous in front of an audience. Using the buddy system gives the presentation day an encouraging feel. I have included six posters for each of the six steps, a graphic organizer, a rubric for grading and a list of topics with links to free resources. I hope this unit helps your students improve their classroom presentations.